With a theme that suggests that it belongs to seafarers or perhaps people who enjoy being aboard of cruise ships, Casino Cruise strikes you with its in depth sophistication and elegance from the first time you log in. With its robust online platform and games from top producers like Net Entertainment and Microgaming, players are sure to enjoy the substance and luxury that comes with such grandeur. As earlier stated, the web browser platform leverages the Quickfire platform proprietary to Microgaming and other platforms from Net Entertainment, Play ‘n’Go and a handful of other forward thinking game manufacturers. 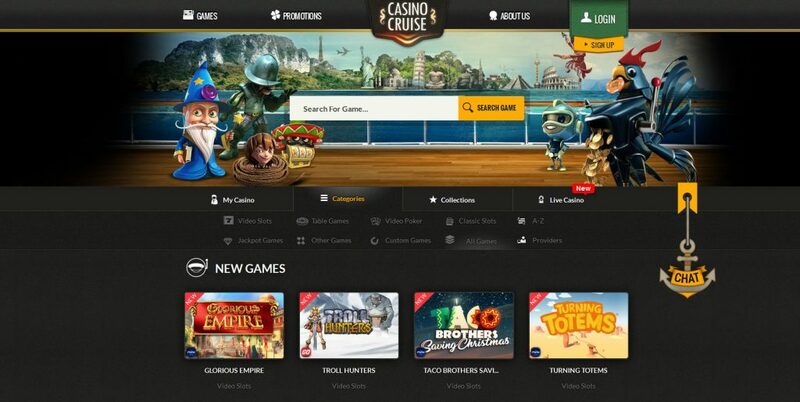 One very wonderful thing about this casino is the fact that it strives to be one of the casinos that are first to release new games so do not be surprised when any member of Casino Cruise is no stranger to games like Game of Thrones, Dragon’s Myth, Forsaken Kingdom and Rabcat’s Dragon Myth. Due to the large library of slot games, there is a very efficient search engine which helps to navigate your way through to your favorite game and also has the capability to display search results without having to refresh the current page. For those who do not have a favorite game yet, there is a category search where games sorted in categories can be viewed. With the search result’s rectangular grid format, players find it very easy to sort games for their enjoyment. Since all players won’t be slot freaks, Casino Cruise has ensured that the many variants of Poker, table games, Blackjack Baccarat and even Roulette. Although the casino is yet to offer Craps but their overwhelming array including Oasis Poker, Red Dog and Texas Hold’em. There is also a live dealer option where players can enjoy live version of Blackjack, Baccarat and even Roulette using any of the eight live dealers that runs in the casino round the clock. 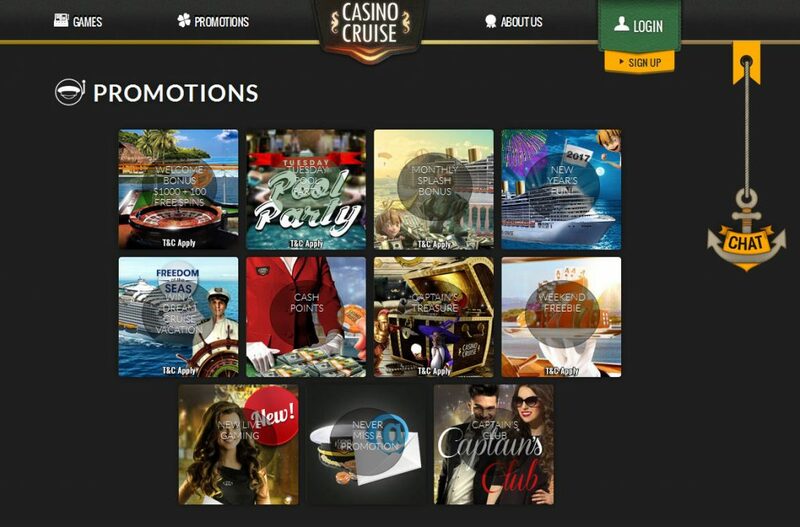 Cruise Casino expect players from several countries and as such not lesser than 28 currencies are accepted prompting the use of several banking options including but not limited to e-wallets, bank-transfers, Paypal, Skrill, Neteller amongst several others. Before any withdrawal can be made, a due diligence process involving the verification of identity documents which usually takes not more than 48 hours. Subsequent withdrawals are usually faster since the due diligence checks are usually a one off. There is also a withdrawal limit in the casino which is currently set at 5,500 Euros and not more than 22,000 Euros although players in the VIP club are able to withdraw up to 50,000 Euros but on occasions where players hit a big one and get 100,000 Euros and above, the casino disburses their funds over a 10 month period. The backbone of every online gaming platform is customer support and at Casino Cruise, it is handled via live chat, email or a dedicated phone number. Although because of the traffic at times the agents might not be able to handle the request and this sometimes causes some lag, however they are sure to get back to you as soon as possible. 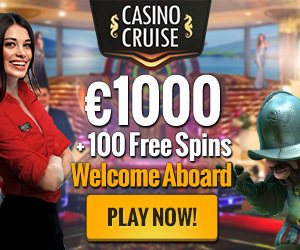 The welcome bonus at Casino Cruise is staggering at 1100 of whichever currency you deposit in out of (Euros, Dollars and the British Pounds) in addition to 250 free spins for players to familiarize themselves with. The minimum deposit is the equivalent of 10$ and the minimum withdrawal is set at the same amount. With a very secure HTTPS connection, all records both transactional and financial are encrypted so any communications you have with the casino are kept away from the reach of cyber criminals. The casino also adhere strictly to several gambling controls such that players can set up limits and terms that govern and restrict their gaming live while in the casino. It is very important that certain players who have gambling problems are able to fix limits for themselves so they don’t go overboard. What most players do for instance is to have periodic maximum limits like on a daily or weekly basis. This rule activates each time they log in and once they pass the limit, they are automatically signed out of their accounts. Finally, players can rest assure that Casino Cruise is a serious minded casino and nothing short of top notch service will be offered therein especially as there operate under license from two of the world’s most reputable gambling moderation authorities which are the United kingdom Gambling Commission and the Malta gaming Authority. More so the fairness and randomness of games at Casino Cruise has never come under questioning and they have published their RTP figures in their help files and also paytables showing a significant level of transparency and accountability in their dealings. However, do not expect all this audit numbers to be contained on a single page and Casino Cruise does not display the payouts that have been audited or monthly reports.